Breakups are never easy, and celebrity breakups are even harder. So how are Gwyneth Paltrow and Chris Martin handling the fallout now that they've announced their separation? By getting as far away from the public eye as much as possible. Anticipating the public frenzy around their separation, Gwyneth and Chris reportedly escaped to the Bahamas with daughter Apple, 9, and son Moses, 7, prior to announcing their split on March 25, Us Weekly claims. The family vacation is their second tropical getaway since December. Recently, the couple enjoyed a vacation on the beaches of Hawaii. 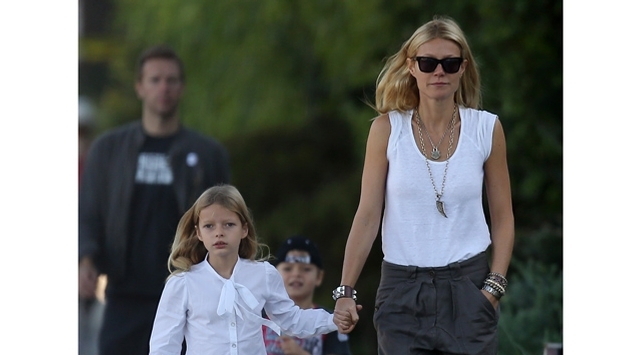 Sadly, this vacation is different, as it comes amid news of Gwyneth and Chris' split. "It is with hearts full of sadness that we have decided to separate," they said March 25 in a statement on the actress' Goop website. "We have been working hard for well over a year, some of it together, some of it separated, to see what might have been possible between us, and we have come to the conclusion that while we love each other very much we will remain separate." "We are, however, and always will be a family, and in many ways we are closer than we have ever been," the statement continued, noting that they are "parents first and foremost" to Apple and Moses. "We have always conducted our relationship privately, and we hope that as we consciously uncouple and co-parent, we will be able to continue in the same manner." The Coldplay singer, 37, and Gwyneth, 41, have been married since 2003.